Call for Contributions > Submit a Sound! 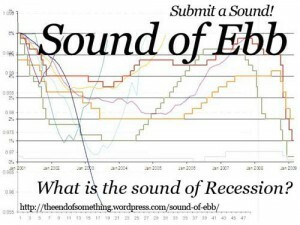 What is the sound of Recession? Artists are asked to create a work or sound recording that responds to the current economic, social and political climate. Pieces can be field recordings, compositions, radio plays, soundscapes, or even songs and pieces of music.. etc. They can be conceptual, personal, critical, creative or interpretive. A moment of recession remarks a deceleration and slowing down – opening up to a space for reflection. When a tide recedes into a breathe of idleness, it leaves a moment for contemplation and listening to the sounds of the Self, of Others and the Environment. In a state of lull is there opportunity forge new values, forms of solidarity, closer familial ties, and explore healthier modes of consumption? Is there value within a moment of quietude and reflection to explore new possibilities for the future? Sound of Ebb is an open project for contribution and interpretation. All works will be uploaded to online for free listening and sharing. Selected submissions will be exhibited and distributed in a free downloadable compilation by LOUDSPKR and Sound and Music. Please specify any terms of usage or creative licensing you would like to apply. i.e. Creative Commons or other similar free cultural license. Sound of Ebb is a branch project of The End of Something.. A collection of reflections on the global crisis. Works should be, but not restricted to 30 seconds to five minutes in length and a response to your social/geographic context in relation to the crisis. Submissions can be produced collaboratively or individual. Early deadline July 31st, 2009 – submissions received before this date will be exhibited at Volume in London UK throughout August. Final deadline August 31st, 2009 – All submissions submitted before this date will be considered for the curated compilation. Submissions will continue to be accepted following the deadline for contribution to the online archive. LOUDSPKR is a test-grounds and platform for experimental music/sound, media art, film/video, performance and multi-disciplinary arts. Through events, exhibitions, and artistic and curatorial projects, LOUDSPKR explores possibilities within collaboration, cultural production and critical arts practice.